Dani: I'm not going to have an argument about whether we're having a goddamn argument or not, right? Moe: That's the only kind of argument I know how to have. I hope you're lucky enough to see this movie - stream it on Amazon for free if you're a Prime member. Best movie in our house this year, mainly for the simple enjoyment of the characters that told the story. The casting, the acting, and the writing are all great. Why? The choice of actors didn't focus on big names (to me), but on people more concerned about the role. The acting was witty and consistent throughout. The writing was true to real life, with uncomfortable elements of conversation, and, yes, people talking over one-another at times (which some viewers did not like, but I found it genuine). 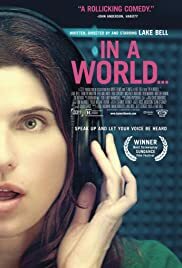 This was the first time I can recall seeing Lake Bell. Was she great or am I just enamored with the resemblance to Amanda Peet? That comparison is more than striking. It seemed that she and Michaela Watkins truly were sisters, given their brilliant, somewhat confrontational, and I'm-there-for-you-when-it-really-matters interactions. -Terrific sound mixing! Quite unexpected surround greatness.